YOO.MEE Shower Head is among one of our champs of handheld shower heads of 2019. During our research we have found that, YOO.MEE and AquaDance 3328 both heads are widely popular. Today, we are going to dessect YOO.MEE High-Pressure handheld shower head. We will find from benefits to drawbacks of the head. Getting home after a long day and taking a relaxing shower has got to be one of the best feelings. However, for this to be relaxing it is important that the shower has water flowing with proper pressure. Only then will the body and mind feel relax. Handheld shower heads are known for the good water pressure they provide. This is because even if the water pressure is not as good as you want it to be, you can always bring the shower head near to your body. It ultimately increases the pressure you feel on your skin. YOO.MEE handheld shower head is one of the best products you will find in the market. It has some distinct features which ensure a relaxing shower. The shower head has three different settings for you to choose from. These include powerful shooting, pulsating massage and mixed. A powerful shoot will send water straight down at you with great pressure. This will help relax the muscles in your body. A pulsating massage setting will allow you to experience a spa-like shower at home. It helps relieve the tension in your muscles and regulates the blood flow. This is a high-pressure shower head which has been carefully designed and manufactured to help you get the right pressure for your showers. A special feature of this shower head is that it increases the water pressure in the shower regardless of the external environments of the pipes. This ensures high pressure no matter whatever the outside pressure is. It allows you to have a refreshing shower as the water comes down on you with proper pressure. The pressure can be customized according to your wishes since you get to choose the settings for the shower. YOO.MEE hand shower head is polished with chrome. This is to help prevent the pipes from corroding. Rush and corrosion decrease the life of the product drastically. In order to make the product long-lasting and durable, it has been manufactured with high-quality materials. This keeps your shower-head and the hose safe from corrosion. 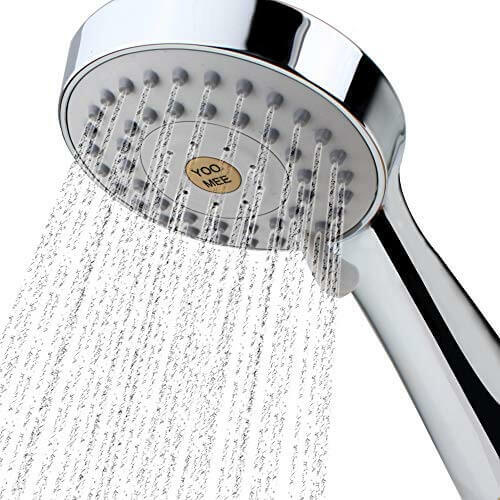 Thus it ensures that you will not have to spend money again and again on a shower head. This one is all you will need. This handheld shower head comes with a number of accessories in its packaging. One of the many things included in the package is a one-way water flow regulator. This is the accessory that helps the shower head provide you with optimum water pressure even if you have low-pressure problems in your plumbing. The water hose in this packaging is about 6.58 feet long. This gives you a long water range. Along with showering, you can also very easily use this showerhead to wash your bathrooms. This is because the long water hose provides ample water range to cover the bathroom. The long water hose makes cleaning the washroom easy and fun. The YOO.MEE shower head itself will not require a lot of cleaning. Often shower-heads stop working properly because of mineral deposits in the nozzles. This product helps prevent that. It has silicon rubber jet nozzles which prevent the minerals from accumulating in the shower head and blocking it. The shower head can be cleaned with your hands. Once you have showered just swipe a hand over the face and it will be cleaned off. The hose is made of stainless steel and has brace connections. This provides hose strength and prevents it from cracking and rusting. This ensures the long-lasting nature of the product. The shower-head will work in its optimum condition for years. So, there will be no need to spend money on shower head again. Despite all the many benefits and amazing features this product has, a few people have complained about the hose. For some customers, it broke from the base. This might be because they over tightened the nuts at the base of the hose. The instruction manual included in the packaging clearly tells people not to do that. Other than that, the vast majorities of customers have been very satisfied with the product and highly recommend it to others. This product is easy to install. You can install the hand shower yourself without calling a plumber and using common tools like pliers and Teflon tape. First: Shut the water supply and remove your old shower head using pliers. Next: Clean the piping and rid them of any mineral deposit. After That: Install the new YOO.MEE hand shower. You can do it by tightening the nuts at the base of the hose along with the installed plumbing in your bathroom. You may also need Teflon tape to install the shower. Make sure you don’t over tighten the nuts. This can be done with hands. So, pliers will not be required. Lastly: Turn the water supply back on and check for any leaks. That’s it! You have installed the hand shower. This should increase your water pressure by nearly one third. Still confused? This video guide can help you for the installation. Q: Is it necessary to use the water flow regulator? A: NO, you may not use it if you don’t wish to. Q: Is an installation guide available? A: Yes, the packaging includes an installation guide. You can follow the instructions provided and you will not have any problems. Also, a frequently asked questions booklet is included to answer any further questions you may have about the product. YOO.MEE Shower Head is one of the best handheld shower heads of the market in 2019. 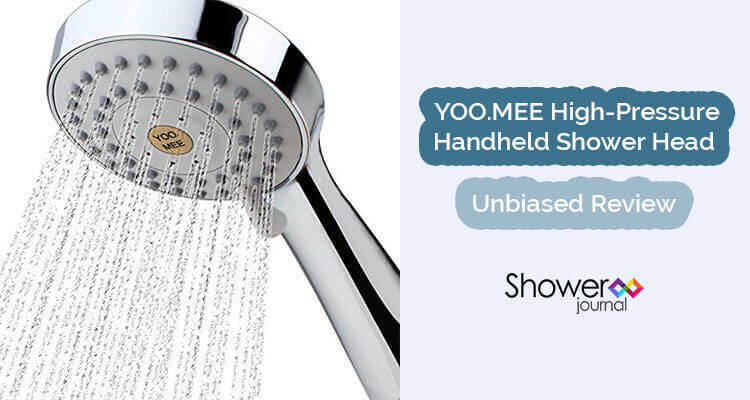 In this article, we have tried to figure out all the pros and cons of YOO.MEE Shower Head. If you still have any question on your mind, please don’t hesitate to drop us a line.